Here are some quality suggestions for mom planners: usually they have both weekly and monthly planning pages included. 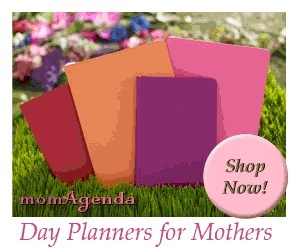 The most expensive, but also the highest quality offering is by Momagenda. However, what all these planners have in common is that they start in summer and cover the Academic Year. In most cases they are 18 month and give you room to plan your life till the end of the next year. Note that 17 and 18 month planners are usually named after the last of the year they cover. So you need the 2016 planner for the academic year 2015-2016 plus the last months of 2016. Depending on the publisher the formats will over different options. Some have handy little stickers to attach to things that you want to almost jump out at you. They are great for marking a doctor appointment for the kids, teacher parent conferences and those other events that happen during the year that you get advanced notice of but could easily miss once the time comes. Mom and Dad can really do it all with these types of planners to help them through the year of planning for their own busy schedules along with those of their children. This practical planner comes in four designs: Watercolor Birds, Folk Birds, Butterflies and Red. I like the butterfly look, don’t you? And yes, all three are 18 month planners, dating from July up to and including December the next year. There are columns for up to 5 family members (including mom) in the weekly spread. In addition, there is plenty of room for notes and monthly overview pages are also included – generously taking up two pages. A great planner for women who do it all! Small enough to be portable but with plenty of room to plan, these Do It All planners have week-per-spread views plus monthly views and an elastic-band closure. They almost all measure 8.25″ x 6.25″ making them easy to carry in your purse. Although some are larger and some even hang on a refrigerator with magnets. 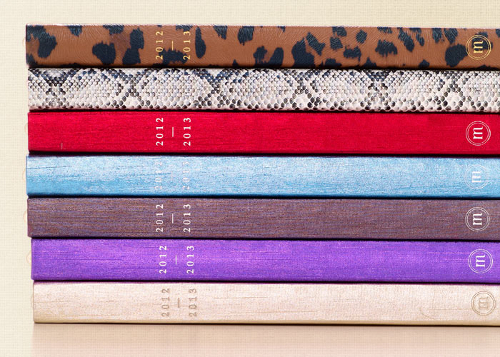 A cute, pretty organizer is just the thing to have to get your life into shape. I have used organizers, instead of regular date books, for years and could not go back. It’s just so practical to be able to archive pages you no longer need, to keep pages with notes and information from last year. A loose leafed system just plain works. The only disadvantage to a loose leafed system: the ones on the market all have you start with an undated set. This has the obvious advantage that you can start using them at any time in the year. But for me that doesn’t compensate for the disadvantage of not having a dated calendar book. On the other hand: once most of that first undated year is gone, you can go on to buy a dated refill and you’ll have all the advantages of a REAL practical planner. 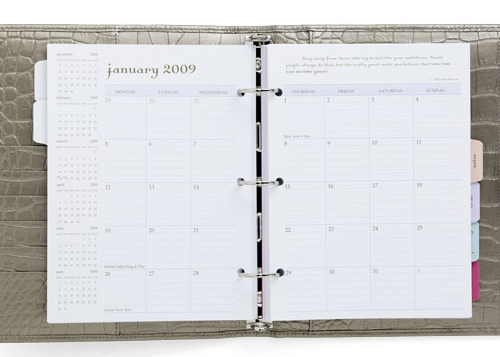 For this reason I’ve listed calendar refills on here as well – fitting the preceding organizer. A Day Runner planner. It includes only three months worth of weekly planner pages, so if you need that amount of room for your day to day organizing needs, do buy a dated refill set too. 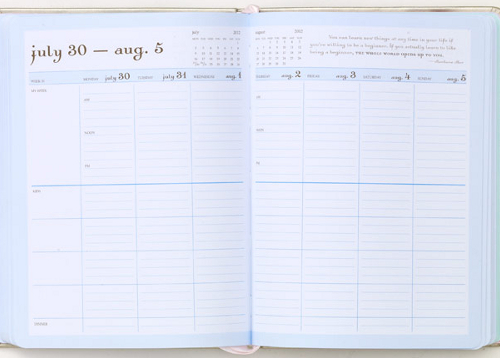 Undated monthly planning pages are included too, so important dates can be noted at all times. An address section is included. I think this one is very pretty with a brushed metal bar strap closure and the color is good too. The Organizer measures 8 1/2″ x 9 1/2″ and takes 5 1/2″ x 8 1/2″ desk-sized Day-Timer loose-leaf refills and accessories. 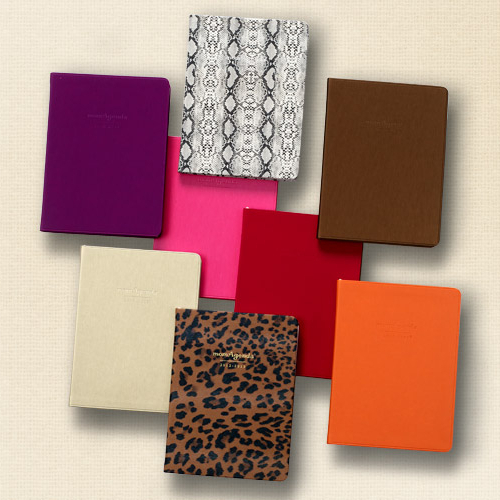 See also this collection of family planners for mom and dad.